In the main, the earliest Black Long-hairs of any notoriety were noticeably males. These included in particular the two well-known males owned by Mrs. McLaren Morrison, 'Neptune' and 'Satan', both born in the late 1880's. 'Neptune' became a noted stud and 'Satan' of whom Frances Simpson wrote, "was never beaten while he lived. "2 In fact, Mrs. McLaren Morrison dominated in Blacks for a number of years, importing, owning, breeding and exhibiting a good number of them. Two of her earliest were black females, both of which were imported, namely 'The Witch' and 'Satanella'(1887), the latter being the dam of 'Satan' (born in 1888). Other early black females owned by her included 'Zulu of Kepwick' (1888), 'Meg' (1888), 'La Mascotte'(1891), 'Juno'(1891) a daughter of 'Neptune', 'Black Diamond' (1893) also out of 'Satanella', and sisters 'Blackberry' and 'Black Cherry', both by 'Satan' and out of 'Zulu of Kepwick'7. Other breeders of Blacks during the late 1880's and early 1890's included Charles Lane and Mr. R.C. Stephens, the latter being the owner of 'Nebuchadnezzar', a male of repute who was also widely used at stud. In very general terms, the males of most varieties were at a distinct advantage on the show bench, often due to their captivating size which, when coupled with significant coats and great breadth of skull, simply demanded attention. But every now and then, a lovely female of the variety would pop her head above the parapet, to show off her specific charms. Amongst black females of particular note toward the end of the nineteenth century and the start of the twentieth, were 'Lady Bruin' (1897) and her daughter, 'Colleen' (1901), the latter who was renamed 'Sweet Lalla Rookh' and duly exported to the United States. So 'Dinah', who was born in 1892 and bred by Mrs. Maile, is still one of the earliest black females of note, and at this stage, the only one for which there is a surviving photograph. Her birth predates that of 'Lady Bruin' by a full five years. She was the property of Miss Kirkpatrick, who first made a name for herself as one of the stalwart early breeder of Blues, and yet 'Dinah' is recorded as her very first purchase. By the turn of the century the most successful breeders of Blacks were considered to be Mr. Robert Little, (the owner of 'Lady Bruin' and the breeder of 'Colleen'), as well as Dr. Roper of the celebrated 'Fawe' strain. It should also be noted that Dr. Roper was the acting Registrar of The National Cat Club. Both of these gentlemen gain significant coverage in Frances Simpson's chapter on Blacks in The Book of The Cat (1903), but she also takes care to mention that "Miss Kirkpatrick has also bred some lovely black kittens"2 and ensures that an image of one Miss Kirkpatrick's fine kittens is included in her article. That kitten, whose image also famously appears on numerous postcards either by himself with the non-de-plume of 'Sambo', or alongside a blue (presumably also bred by Miss Kirkpatrick) with the title 'The Rivals', is very likely to have been a grandson, or great-grandson of Miss Kirkpatrick's beloved 'Dinah'. The registration of 'Dinah' is an unnumbered entry that appears on Page 22, Volume II of The Cat Club Register published in 18986. As her sire is unknown, the entry simply begins with her dam, a female named 'Beauty' owned by her breeder, Mrs. Maile. 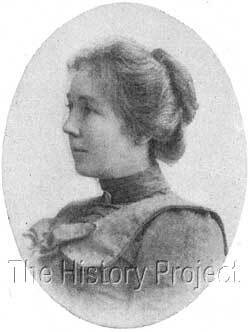 Her date of birth is listed as 'July, 1892' and her owner as Miss Kirkpatrick of The Gables, Harrow. From an article written by W.M. Elkington, in 1900, we discover that 'Dinah' was in fact the very first Persian cat that Miss Kirkpatrick ever owned, being purchased as a kitten at the Crystal Palace Show of 1892, where she had taken a second prize. She appears to have remained with Miss Kirkpatrick for her the whole of her breeding life and although she was shown occasionally, was more of a breeding cat for her owner than a show specimen. For her part, from the registration records, Miss Kirkpatrick was one of the early fanciers and breeders of Blue Persians, but one who quickly carved a name for herself within the variety, becoming ,in the words of W.M. Elkington, "one of the best-known breeders of Persians"2. One of her earliest blue Persian's of note was a female named 'Peggotty', born in August, 1893, bred by Mrs. Foote, sired by Mrs. Foote's 'Byngo' and out of 'Bright Eyes'6. 'Peggotty' who was born in March 1897, was in turn the dam of a 'pure blue' Persian female bred by Miss Kirkpatrick, named 'Blue Phyllis', sired by the exemplary show-stopping blue male of the early 1890's, 'Ch. Woolloomooloo'. Two years later, in 1899, 'Peggotty' was bred to 'Don Juan II' a blue male bred by Mrs. H.B. Thompson, and at that time owned by Miss Kirkpatrick. This combination produced the lovely blue female kitten 'Lavender Blue', who was retained and shown successfully by Miss Kirkpatrick, bringing her considerable kudos as a breeder of Blue Persians. But Miss Kirkpatrick did not confine her interests exclusively to blues and blacks, she also bred self-silvers (Chinchilla's) and dabbled in whites. She befriended the celebrated breeder of Whites, Miss Kerswill, and must at some point in time taken Miss Kerswill's well known female 'White Lilac' on loan, as she is duly recorded as the breeder and owner of a white neutered male named 'Avril' (born in 1899), sired by the famous 'Champion White Friar', out of Miss Kerswill's 'White Lilac'6. 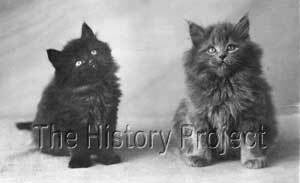 The photograph shown left, of a Black and a Blue Persian kitten, was taken by E. Landor of Ealing. 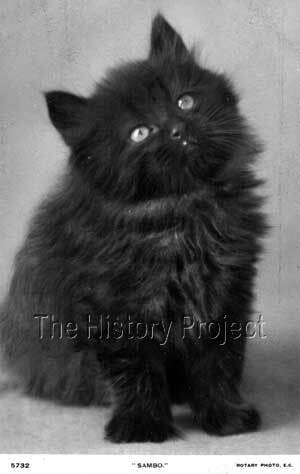 The image of the black was used independently, appearing in the chapter on Black Long-hairs in Frances Simpson's 'The Book of The Cat', with the caption, "Black Persian kitten bred by Miss Kirkpatrick". It was also sold as a full-sized separate postcard, often appearing with the kitten named 'Sambo'. Similarly, the image of the blue kitten, (which we must presume was also bred and owned by Miss Kirkpatrick), appears as a separate postcard, often with the name 'Topsy'. Given that these kittens were photographed for a publication in 1903, the black is therefore likely to have been a grandson or great-grandson of 'Dinah', while the blue, is also very likely to have been out of 'Lavender Blue'. No record exists of any siblings to 'Dinah'. Her only recorded show wins were the second prize as a kitten at the Crystal Palace Show of 1892, with her best win as an adult being a First at Holland Park. For the most part, she was a much-loved pet and brood queen. It is certainly as a brood queen, that 'Dinah' made a contribution to the growing fancy. Unlike many breeders, Miss Kirkpatrick enjoyed exhibiting her pets just as much as her valued breeding stock. 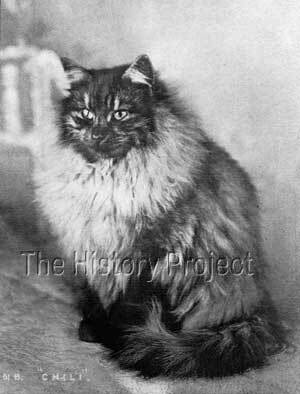 In 1895, she bred 'Dinah' to Mr. James Dewar's 'Bogie', to produce the smoke male kittens, 'Chili' and 'Wooly'. 'Dinah' also appears to have been bred on at least two occasions, to Mrs. Ransome's blue male 'Darius III'. One of these matings, produced a female named 'Nicotine' (presumed Black), who became the property of well-known Chinchilla breeder, Mrs. W.M. Neild. 'Nicotine' was bred to 'Ch. Silver Lambkin', producing a Smoke Persian male, named 'Silver Spot' who was born 8th May, 1900. 'Nicotine' was also the dam of Mrs. Neild's queen 'Cikka', who was in turn the dam of a Shaded Silver female 'Dorothy Vernon'6. A repeat breeding of 'Dinah' to 'Darius' also produced a Black female, born 6th April, 1900, who was registered as 'Dinah II'. This little lady was sold to a Miss O.J.M. Rose6. 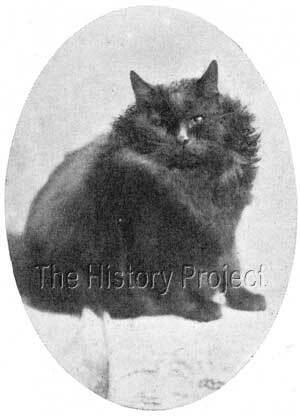 This image by Landor, also appears in chapter on Black Long-hairs in 'The Book of The Cat' (1903) by Frances Simpson. There, it is notated as being a black kitten bred by Miss Kirkpatrick. It is highly probable that this kitten is a grandson or great-grandson of 'Dinah'. 'Dinah' fittingly represents the many early black females of whom usually very little is known, but which none-the-less played an important role alongside other queens in helping to establish a number of cattery lines. Out of a number of the very earliest blacks carrying dilute, came some of the first blues, on occasion from the mating of a solid black to a solid white. Her photo is also unique, as the earliest found to date of an identifiable registered black female born in the early 1890's. It is often said the behind every great man is an even greater woman. It could also easily be said that behind every great Black Persian male, is an equally great Black Persian female. And although we know that females of other colors can also produce black males, a great many of the greatest black males throughout Persian breeding history, have in fact, come out of very valuable and usually uncredited black females of superb quality.